Please note: As of 2014, the Strength Engagement Track or (SET) tool referred to in Go Put Your Strengths to Work is no longer available. 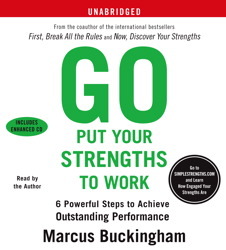 The SET code provided in this audiobook has been automatically upgraded to provide access to Marcus Buckingham’s newest strengths assessment, StandOut. To take the StandOut assessment, please go to StandOut.tmbc.com, click 'Join Now' and enter your code. Please disregard directives for the Strength Engagement Track or SET tool throughout the program.